Jack Pine is a fire adapted species. 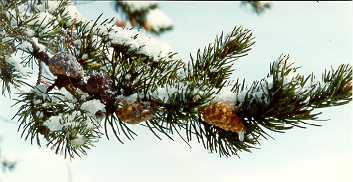 Jack pine trees can bear serotinous cones (cones remaining closed until the occurrence of high temperatures such as created by a fire) and non-serotinous cones (that will open when mature, even in the absence of high temperatures). The occurrence of lethal fires tends to favor serotinous-type jack pine trees to the detriment of non-serotinous trees (fig. 1; Gauthier et al., 1996). Serotinous jack pine trees killed by a fire can disperse seeds, thus ensuring stand regeneration, while previously dispersed seeds from non-serotinous trees will be destroyed by the same fire. In contrast, on islands where non-lethal fires have been recorded, non-serotinous and " mixed " trees are more abundant while serotinous trees are less abundant (fig. 1). The occurrence of non-lethal fires, while providing an advantage to non-serotinous trees that can seed in after low intensity fires and, in the absence of fire, is also thought to be responsible for the uneven-age structure of jack pine populations on islands (fig. 2; Gauthier et al., 1993). On the mainland, even-aged populations are observed, where most trees are established within 10 years after the occurrence of a fire. Fig. 1. 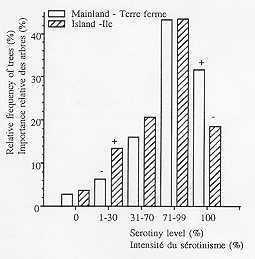 Frequency distribution of tree's serotiny on the mainland and on islands in the Lake Duparquet area. + or - indicate a significant excess or deficiency of trees in the serotiny class, respectively. Fig. 2. Age structure of selected populations of Pinus banksiana. Arrows indicate the occurrence of a non-lethal fire within a particular age class.